Well that’s it then…summer (such as it was) is all but gone and Autumn is ready to take the over the reins. 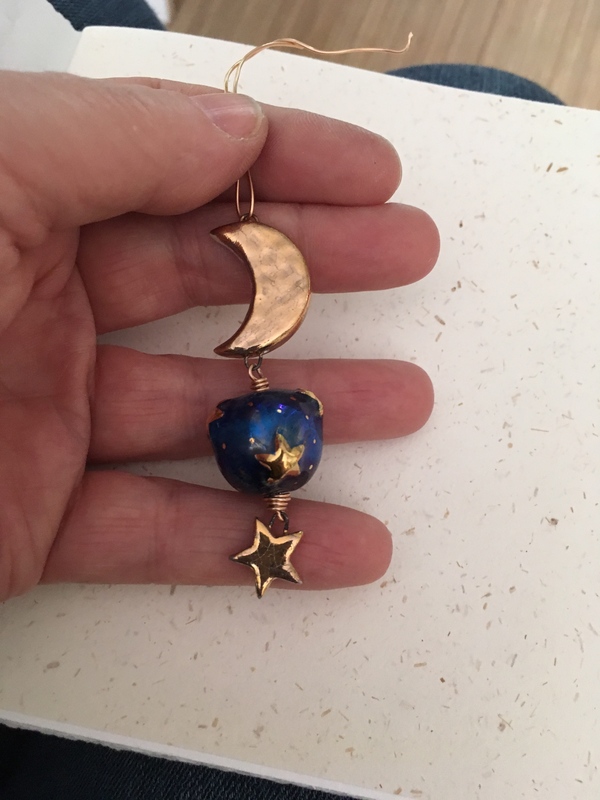 August has been a manic month devoted almost totally to shows and unfortunately left me very short of time to do anything else including create something epic with these wonderful lustre glazed star beads that Caroline so kindly created for us. So my post this month is a very flimsy work in progress. I hope to work on my piece in the next month although that to is dedicated to shows… no peace for the wicked! These beads have the most wonderful blue lustre glaze that have been decorated with gold lustre on-glaze. 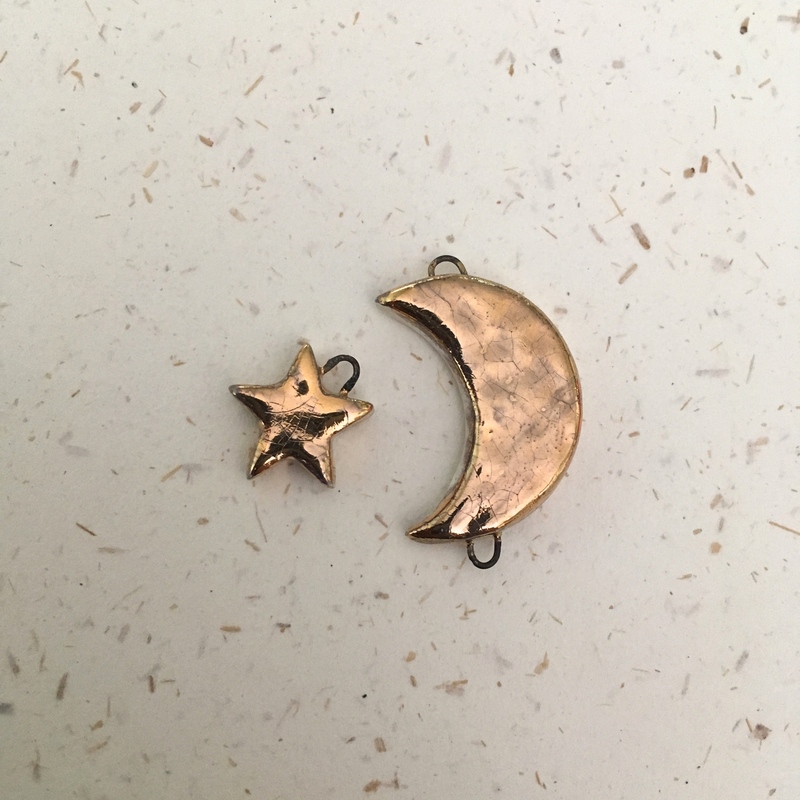 I was looking for something to complement them and just happened to have a gold lustre crescent moon and star that I’d made for one of my own bead sets. Probably not the most imaginative combination but the best option under the constraints I had. I wrapped the 3 pieces together with bronze wire to see how they worked as a layered pendant and was happy enough with how they looked. I couldn’t however make my mind up how to continue from there though. I’d wanted to create a necklace with more beads but I was struggling to find anything that sat well with the focal. Having run out of time, for now I’ve just added a twisted bronze ring and hung the pendant from a heavy blue leather choker…I’m hoping that if I keep it in eyesight in the studio something will click and I can eventually give it more interest. 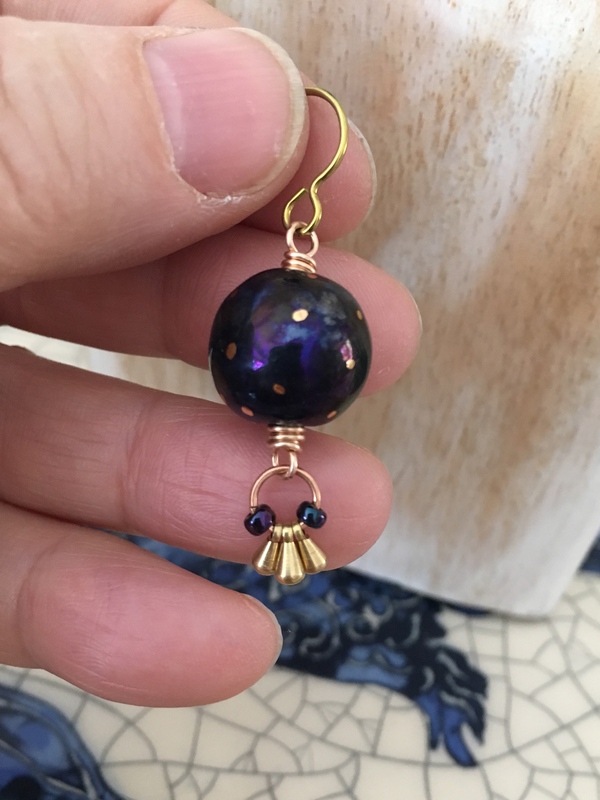 I was aiming to make earrings with the other two beads from the set and I did manage to get one made up…very simple but not without charm. Loving your designs so far, your charms are a perfect match… I’d be tempted to just wear the pendant on the leather! The earrings are gorgeous too… those brass dangles are one of my favourite components. I agree with Caroline & Laney, the beads are just perfect on the leather as is. 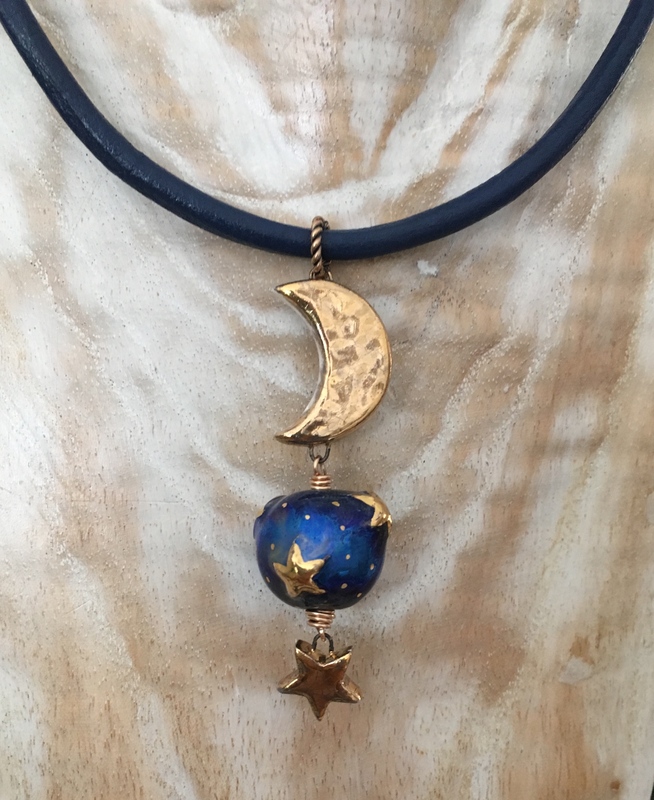 Caroline’s beads are perfectly paired with your gold lustre star & moon. And I love that you made earrings out of the matching beads! I think it’s perfect just the way it is! There are so many different ways to showcase the same thing! I love the simplicity and the pairing with your own work. And the little dingle dangles with the earrings are perfect. You paired the beads beautifully with the star and moon! I love that…and those dangles are super cute on the earrings! I personally love the necklace as is, I don’t think it needs any thing else, it is beautiful and very wearable and the earring is very charming! I do really like the necklace the way you have it, and it’s great you already had bead that perfectly matched Caroline’s! I love it just the way it is. It needs nothing else. Your luster glaze on the moon sparks the glaze on the stars. Gorgeous.